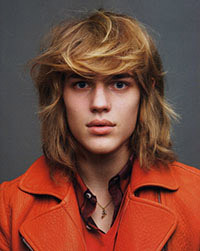 Ton Heukels was born in Leiden, Netherlands, in 1993, is a Dutch male model. He was scouted while on the holiday with his girlfriend in Milan, Italy (2011), signed to Elite Milano. Ton's hobbies are mountain climbing, playing guitar, going out and listening to music. Fan of boxer Muhammad Ali. His favourite film is The Big Lebowski (1998). Stylist Magazine France, ODDA, Open Lab, Numero Homme Germany, The Hunger online, GQ Turkey, Fiasco Cover, Another Man, Flair, CLIENT Cover, Narcisse Cover, Electric Youth, Dazed & Confused Korea, L'Officiel Art Thailand, Lab-A4 Cover, GQ Style UK, Vogue Hommes, GQ Style Korea Cover, Glass Magazine Cover, L'Officiel Hommes Germany, August Man Malaysia, D'Scene, unFLOP Italy, The Wild Cover, Reflex Homme Cover, Flaunt, Forget Them, Tings Magazine, METAL, ODDA, Men's Uno China, DSECTION, Punkt, L'Officiel Hommes Netherlands, L'Officiel Hommes Thailand Cover, The Wild, Horse Magazine Cover, MFF Magazine, British Vogue, Open Lab, Wonderland, V Man, Caleo Cover, MMScene Cover, GQ China. French Connection, Dsquared2, Giuseppe Zanotti, Emporio Armani, Versace Jeans, Etro, Scotch & Soda, Marithé et François Girbaud, Trussardi, Balmain Hair. Walked runway for Ermanno Scervino, Dsquared2, Etro, John Richmond, Philipp Plein, Moschino, Trussardi, Ports 1961, Diesel, Hermes, Emporio Armani, Boglioli, Dsquared2, Versace, Roberto Cavalli, Missoni, Ermenegildo Zegna, La Perla, Tom Ford, Giorgio Armani. Represented by agencies Elite Milan, Models 1 London, Wilhelmina New York, Amsterdam Republic, Berlin nest model management. I love shooting with animals! When I just started I shot with lions, which I still think is really cool. Also, I’m a big fan of late call times and chocolate on set! There are some things money cant buy. I wish to climb the Himalayas soon. Obviously the whole social media thing has changed the industry quite a bit. My favorite fashion city is probably New York because i like the people there and the energy it radiates.